Another e-design service launched this year, looking to solve common problems with furniture shopping and interior design. Here's what sets Spruce Up apart from other e-design services. Last month a new e-design service, Spruce Up, hit the internet. After raising $1.5 million in investment last February, e-commerce and design lifestyle experts Mia Lewin and Mike Dierken launched their e-design platform, which aims to take the guesswork and endless of scrolling hours out of the home furnishings shopping equation. 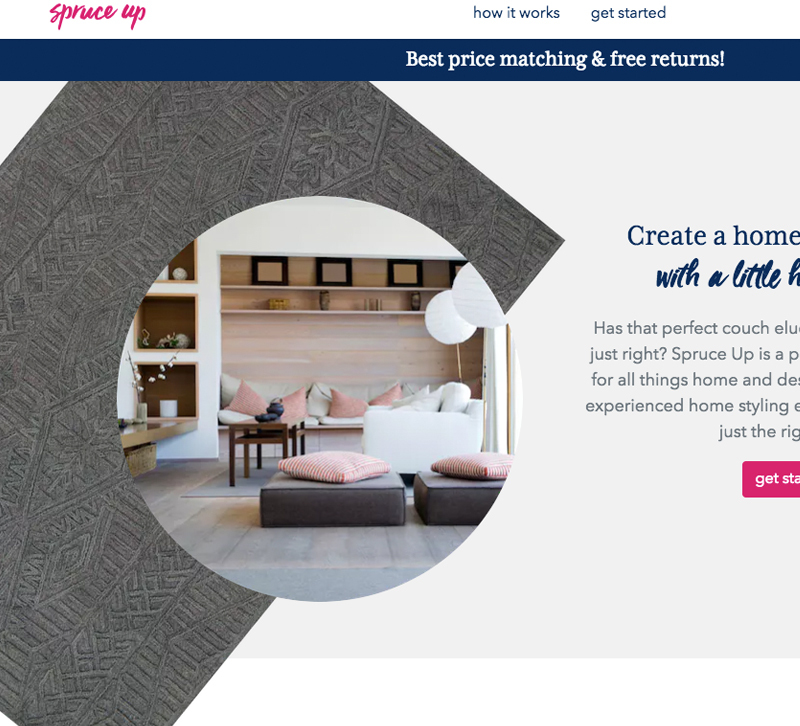 Spruce Up combines artificial intelligence with a designer's eye to help users pick out the right products for their project without overwhelming them with options. After taking the style quiz to determine a design preference, users will be matched with a stylist and pay a $25 fee, which can later be credited towards a purchase on the site made within 14 days of receiving product recommendations. The user will then be able to chat with the designer and send mood boards and other information that will help the designer curate products. Once the designer has a clear idea of what the user wants, he or she will create a list of up to 12 products — a "mini boutique" experience, according to the website — and the user can buy the products he or she wants. If the user does purchase through the site, Spruce Up handles all the orders and deliveries, and returns are free, though the company says it will not refund the original delivery fee. What it boils down to is this: Designers at Spruce Up do the scrolling and research for the consumer, narrows down the choices and lets the consumer make the final decision. It's not quite the e-design service that Havenly provides, but for the frazzled consumer who is tired of bouncing between websites and just wants help making a final decision, Spruce Up could have some good traction. Both Lewin and Dierken come from the product design and e-commerce spheres, and they're looking to do for home design what Stitchfix did for apparel. So what sets Spruce Up apart from its competitors? Here are three things interior designers and retailers should be taking note of with the launch of Spruce Up. In most cases, online shopping shines as a lifesaver for consumers who want to save time running to the store after work or school. Out of toilet paper? Order it on Amazon and it'll be waiting when you get there. Need to restock your favorite beauty products? Skip the store, order them from your phone and go home and relax instead. With furniture shopping, however, consumers have so many options, and that can be overwhelming and difficult to make a decision. Spruce Up's ideal consumer is tired of looking at so many different options and wants someone with a good eye for design to make recommendations. This goes hand-in-hand with the time issue. Spruce Up is specifically going after Millennials who don't want to spend the time shopping for furniture and lighting, and that could be a niche worth targeting — one that Amazon seems to be doing with the launch of its private label furniture collections. For some consumers, it seems that the time saved is worth the risk of ordering something that doesn't fit or something the consumer doesn't end up liking. So long as there's a good return policy, customers may not worry so much about ordering bulky furniture online without seeing it in person. Spruce Up has over 20,000 products to be included in these mini boutiques, and the companies featured range from West Elm and BluDot to Loloi Rugs and even include some smaller, more obscure companies. For this Millennial consumer who doesn't want to dedicate a lot of time to home furnishings shopping, brand recognition could ease concerns over product quality. They might have established relationships with these brands, and they'll feel more confident in a big furniture purchase being made without seeing the piece in person. On the flip side, of course, the consumer could also go to the store and check out the product before making the purchase. In an article for Forbes last week, contributor Amanda Lauren wrote that finding good help at a brick-and-mortar store is challenging and that online shopping often leads to endless scrolling. This is just an observation of one writer, but it does beg the question: Do consumers, especially the younger ones that Spruce Up is going after, feel that furniture and lighting showrooms have poor customer service? Take it with a grain of salt, but it may be worth revisiting how you approach customer service. If more and more consumers prefer online shopping — even for furniture — because of the time saved, how will your store adapt to that consumer? Is your website easy to navigate? Is it easy for customers to add products to their shopping carts and check out? What do you think of this new e-design startup? Let us know in the comments!